Where do you create? Are you fortunate enough to have your own craft space dedicated to your hobby? I am and it took many years to find out what I needed versus what I like. My craft space has changed over the years; I have changed furniture and even the room! But I finally planted roots in one of the bedrooms in my house and was ready to change up the space to meet my needs. 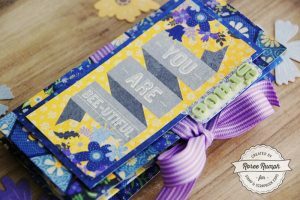 My scrapbooking style has evolved over the years – I have gone from making 12×12 albums, to mini albums, to cards, to planning. 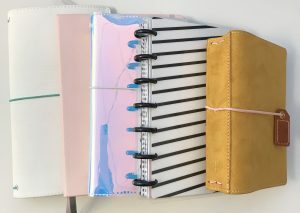 I’ve covered about every paper trend over the years. What I have come to realize is that what is important to me when I am creating is organization. When my things are organized, I am an efficient crafter. When designing this part of my room, I went for organization and versatility. The four containers are separated by theme. One is letters or fonts, one is travel products, the next is dies, and the fourth is miscellaneous stamps. 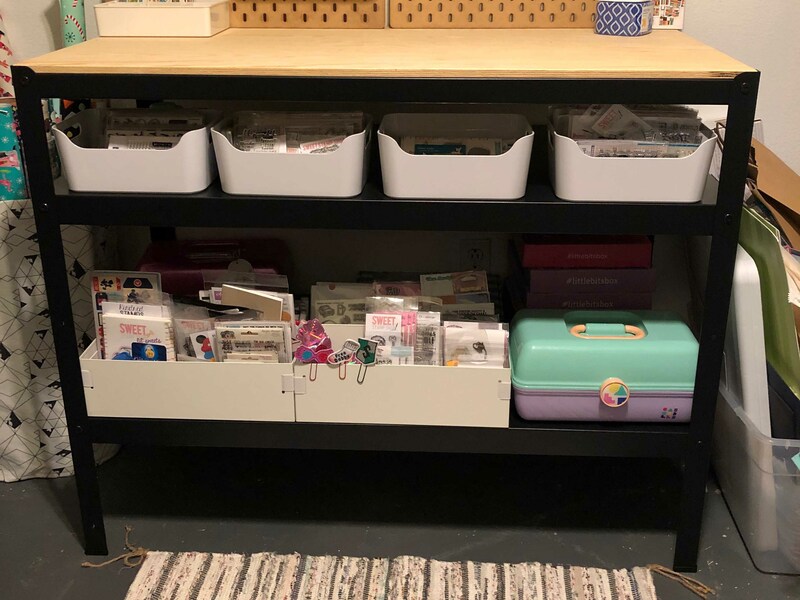 I also house my paper trimmer and my laminator on that shelf in the back of my containers. I am also a stander! 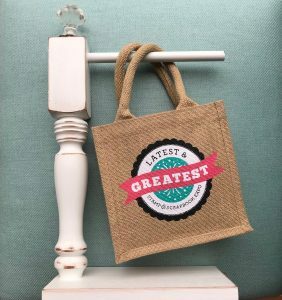 Any other “stander crafter” out there? What the heck is that, you ask? Well, it is a crafter that stands while they create. I knew I would work best with a counter height table. Luckily I am not very tall so this table works like a charm! The two shelves hold my containers. I have them organized by stamps and dies on the top shelf. The bottom shelf on the left houses two white containers. One of them holds my Copic markers in the back and all my Disney-themed items in front. The other one contains all my Harry Potter-themed items. Those are the two subjects I work most with. I have three Cabodoodles boxes. Does anybody remember those from the 80’s? Yep, those! I love mine! I put all my planner items in them when I need to go somewhere. They are my travel craft boxes and they work brilliantly. I picked this wall for this particular station in my room for the natural light I get throughout the day. This is just one section of my room, I have three other stations as well! Do you want to see them? Follow along and I will report on all the different areas and why they work so well for me. You can also see Instagram stories of my space if you follow along on Instagram under Tina Keyner. This entry was posted in Blog, Wandering Planners and tagged organization, Storage, Wandering Planners. I to am a stander and have a bedroom for my craftroom. However, I have collected to many items in the almost 30 years I have been cardmaking. I seriously need to downsize my collection lol. Yay stander crafters unite!!!! It felt good to downsize my stash! I donated it to in a school so that felt even better!!! 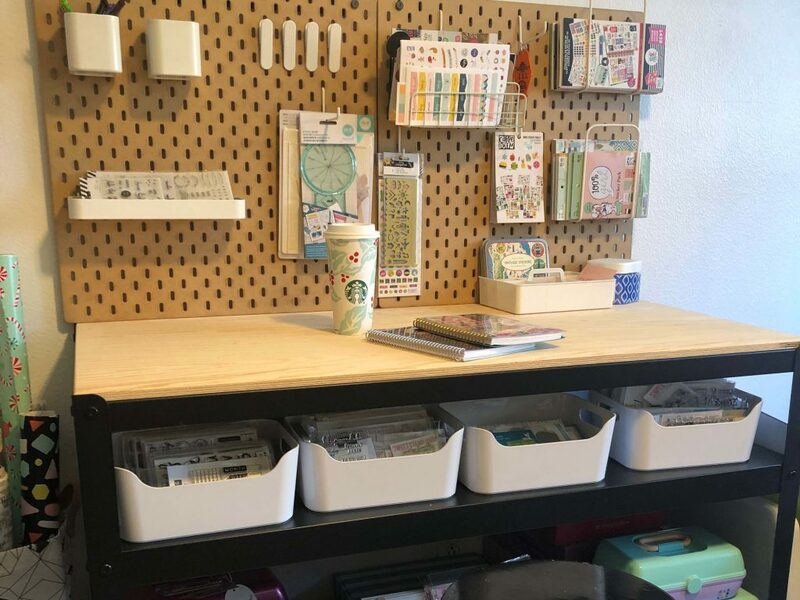 I’m presuming, based on Jennifer’s comment that this craft room is designed for standing and not sitting. There is no way I would be scrapbooking standing up for many hours. So for me, this organization plan for storing your stuff is nice if that is your intention — storage only. But if it is to be a work space it doesn’t work because there is no way you can sit and have all your supplies below the table (very inconvenient) and besides, your knees would be bumping into all your stuff as you work. That’s my thoughts on the design. For me, it just would not be very practical unless I was setting it up as a storage space for my supplies. This is a very tidy craft space but would never work for me I need to be able to sit and stand and need much more storage space. funny how we all carve out what works for our individual needs. 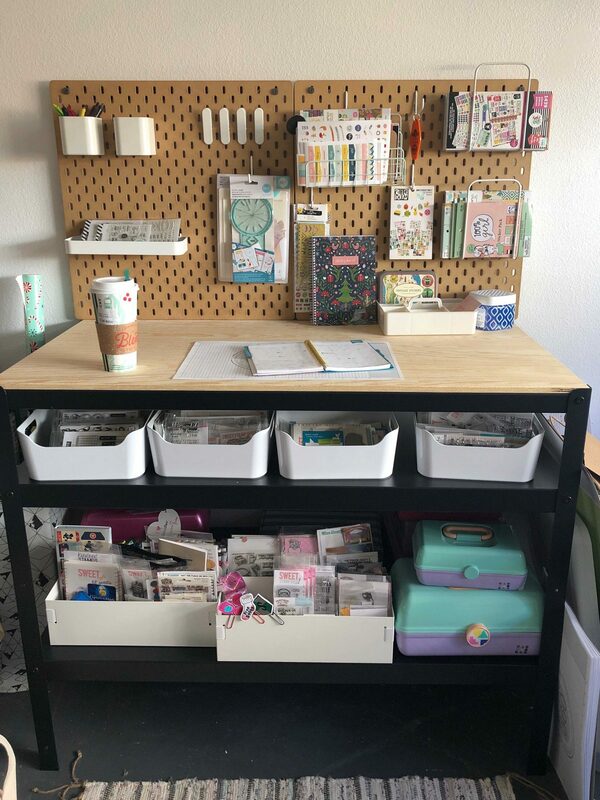 I sometimes wish a small space would work for me but if I cut back my stamps and dies I know as soon as I did I would have a need for what I didn’t keep lol. SO true! Everyone is different… I am a planner girl. SO I don’t need to much stuff other than what I use. The shelves go deep and the only thing I really store is stamps. I did not pan over to the other side of my room.. I will save it for another post. But all of my paper and other supplies are there.